Yes, yours truly. With my wife Paulie and our two little kids. All the way from Massachusetts across to California and back — 11,200 miles in a fast 42 days. Most of it was great. A few things went wrong. I wrote a zillion words to finance it. It seemed a zillion! It was 1960. I was 31, a writer on Feature Parade, the magazine of the Worcester (Massachusetts) Sunday Telegram. Circulation 100,000 every Sunday. An estimated 150,000 taking at least a look every Sunday. I yearned to see the USA. Had never been farther west than a few hundred miles from home. I was a young dad with two little kids. Well, with an elderly friend handy with tools, I built a folding tent trailer — a newfangled thing back then but so wonderful for a young fellow eager to Go West! But had to do it on a tight budget. Couldn’t afford a factory-made one. And I wanted Paulie to share the adventure. We’d face a special challenge. We had our little Arthur and Monique behind. Unthinkable to leave them behind. Somehow we’d manage. And I’d write stories about all that. Well, because I was a writer and that’s what writers do. Also because it would be the way to pay for our adventure. That’s the way I looked at it — a great. marvelous adventure. Truth is, my folks and Paulie’s and some of my newspaper colleagues opined it was a wacky idea. Paulie thought the same thing when I brought it up. How fortunate I was she sided with me. I’m sure she had her fingers crossed. But I got only two weeks of vacation. What to do? I talked Fred Rushton, my editor, into letting me tack four weeks onto my two weeks coming up, those extra weeks without pay. And — this was key — agreeing to publish my travel reports at the magazine’s going free-lance rates. He took a week to think it over. Imagine my suspense! Then said, well okay…. Paulie taught second grade in public school, so she had the summer off. Perfect. So with her at my side… and Arthur, just two and a half, and Monique, just one and a half, in a play pen I built for the back seat of our station wagon… and every spare inch jammed with supplies, we set out for California. Or bust. That was a few years before our little son Mark joined our family. What kind of writing did I have in mind? First, I’d do personality profiles, but with people along the way who had a strong connection to Worcester. For instance, an actor in Hollywood who grew up in a Worcester suburb. The manager of the L A. International Airport; he had jumped to that big job from being manager of our Worcester Airport. A young couple, neighbors of ours in Dudley, who had migrated to California, for good. And so on. It’s that local angle which had convinced Fred Rushton to go along. Second, I’d write about our experiences along the way, good and not so good. And also impressions of the Grand Canyon and Yellowstone National Park and other famous tourist meccas. And some far less known but worth knowing. By the way, that long ride of ours was long, long before our fantastic Interstate Highway System. It was slow roads all the way to the Pacific and back. Through mountains and prairies and deserts and agricultural lands. And into huge cities and little towns. Enormous hard work. For one thing, I had all these appointments that had to be respected. On this date in Detroit for this one, and on that date in Malibu for that one. And of course we had have to find a campground each night, set up our tent trailer, cook our chow, put the kids to bed. Then get up early, rush and get ready, break camp, and hit the road again. And rush on to the next appointment. Hard on Paulie for sure. Whenever I went in to interview someone, and take some pictures, which could take a while, she had to sit in our station wagon and mind the kids. A good sport. We slept under canvas every single night. Some things went wrong, of course. Wouldn’t be an adventure without the possibility of that. And lots of tension for both of us, it developed. Paulie had her way of doing things and I had mine. We both did our best to be patient and forbearing.We managed to return home on our scheduled 42nd day still happily wed.
One thing went very wrong. I hurt my back hard one night lifting a corner of our trailer with my two hands. Every night I would jack it up to make it level for a decent night’s sleep. This time I was tired and in a rush. I skipped the jack. In Polson, Montana, right on the shore of magnificent Flathead Lake.. Went to bed in great pain. At 2 a.m., excruciating. Needed to get to a hospital. Paulie ran to a couple in a tent a hundred feet away. Total strangers. Woke them up. Explained. The startled young guy said, “I’ll drive him!” What a Good Samaritan! That was one of the joys of the trip — meeting so many fine people and of all backgrounds. Well, no hospital in Polson. But were told by a parked cop there was a chiropractor nearby. Had never been to a chiropractor. I was leery. Rang his doorbell. He was sound asleep upstairs but came down to check who was ringing at such an unholy hour. Well, he did a fine job. Had to return for two more treatments. It set our schedule back three days. Arthur and Monique were angels all those many miles. Except Arthur one morning. We started driving. Paulie looked back to check the kids. Arthur didn’t have his shoes on. Where were they? We couldn’t find them. We had driven 20 miles or so.I made a U-turn and we went back to our campsite. Found the shoes. He had thrown them out the window! Yes, our journey did turn out to be the wonderful, fantastic adventure I hoped for. We covered those 11,000 miles. Good weather and bad weather. Saw wonders of all kinds. Not a single encounter with a bad hombre. Came back on the 42nd day, just as planned. Triumphant and delighted. Both of us. Recently I gave my daughter Monique a fading copy of the first big article I wrote about it when we got home. It was the “play” article –the major article–in Feature Parade that Sunday. It ran four full pages, along with photos, all by me. It’s the one you saw up top. Monique surprised me by scanning it and emailing it to members of our family. Very nice of her to do that. Some had little memory of our adventure, and in the case of our in-laws and grandkids, had never heard of it. Monique also sent me a copy of it. Reading it, I had an idea. Maybe some of you would find it interesting. By the way, that article was just the first of at least half a dozen full-length Feature Parade articles I wrote about our trip. 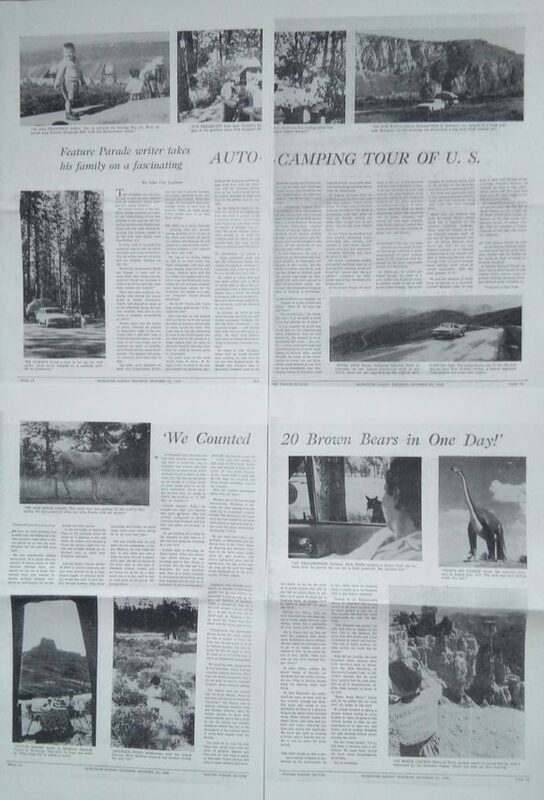 Also a series of some 20 articles ab0ut national parks and monuments we visited. These were published one Sunday after another in the Travel Section of the Sunday Telegram. Reader response was enthusiastic. Fred Rushton and Nick Zook, the editor of the Travel Section, were both tickled. Got to tell you again all those thousands of words were pounded out by me, yes, on a free-lance basis, on the side, separate from my regular writing assignments for the magazine. A darn god thing I could type with all ten fingers! Well, in time I became editor of Feature Parade Magazine. As boss, I had a constant stream of six issues in the works. For example, at 8:45 on this coming Friday night, the magazine would be printed for inclusion in the nearly two-inch-thick Sunday newspaper. We published a morning paper, the Telegram. And an evening paper, the Gazette. And the huge Sunday Telegram. An enormous job. It took a payroll of 850 people to get all that done. Different sections of the Sunday paper–the Travel Section, the House & Home Section, the Week in Review Section, the Book Review Section, and other sections, would be printed during the course of the week. It was the only way. And the sixth magazine in that rigid schedule of six issues at any one time might be for the Sunday of Labor Day weekend, say. So what would be a good play article to tie in with Labor Day? Should be something new, fresh. It might take special expertise in business or economics to write it. So who should I get to write it? And what should be the big front-cover photograph to kick it off? What pages should I run the story on? And so on. You know, I found the work so interesting that sometimes I had a hard time falling asleep at night. But why am I telling you all this? Good question. I thought you might like this brief insight into that kind of journalism. Of course, it’s virtually impossible for you to read my actual story as seen in that photo of it up top. If you’d like to read the article, please contact me and I’ll try to make that possible. I said we took the trip because I yearned to see the U.S.A. It did that. But know what Tha just fanned my yearning to travel. I went on traveling and traveling, as some of you know, and most of it solo. Around the world. Across the Equator and back up. Around Asia. To every country in Europe except the topmost three. To India twice. To China four times. To France 10 times. To Mexico several times. To Brazil twice, and to several other South American countries, including Panama. To all 50 states, some several times. And I’ve written about all of those travels. Again, that was a main incentive. In articles and books. Well, I’ve asked doctors if they think I might have caught travelitis when I was young. And never got over it. Travelitis? They tell me they’ve never seen a case of travelitis. Well, okay. The good news, I tell them in case they ever diagnose it in someone else, is that travelitis totally vanishes in old, old age. Just fades away. How about that? !